For the adventurous at heart, camping can be a great way to escape reality for a short period time and experience the beauty of nature. And Georgia’s geography, which includes a mountainous terrain, plains and forests, provides the perfect environment for such an activity. However, camping isn’t always as simple as it seems. Real, nitty-gritty camping requires survival skills that some might find difficult and frustrating to learn, like putting up a tent or starting a fire. There are some who may enjoy nature but would prefer not to sleep on the dewy ground. That’s why there’s glamping in Georgia. Glamping is short for “glamorous camping.” It allows you to escape to the outdoors without having to sacrifice many comforts. Some of Georgia’s glamping sites provide beds, Wi-Fi, kitchens, air conditioning and heating. 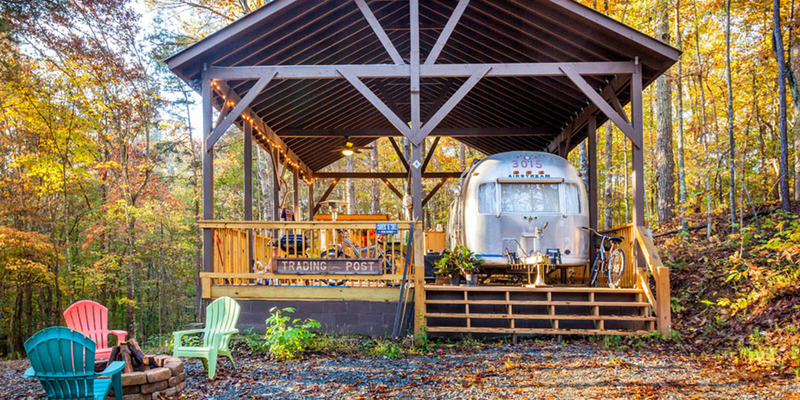 See the list below to find out about the many ways you could go glamping in Georgia. Take a trip to the Appalachian Mountains and camp out in a dome-shaped tent nestled on a 6-acre farm in Ellijay. The dome houses four to five people and includes a bathroom, bathtub and outdoor shower, according to the farm’s website. Reservations can be made through Airbnb or Glamping Hub, which list extra amenities like a kitchen, coffee maker and running water. Yurts are round, tent-looking structures that were first used by nomads in Central Asia, according to glamping.com. According to the Georgia Department of Natural Resources, you’ll be able to find yurts in many of Georgia’s state parks like Red Top Mountain, Cloudland Canyon, High Falls, Sweetwater Creek, Fort Yargo and Tugaloo. These yurts can house six people, and High Falls’ yurts can house up to five, according to the DNR. The yurts also contain ceiling fans, small heaters, screened windows, locking doors and electrical outlets. In addition to your personal items, all you would need to bring is linens or sleeping bags, pillows for the pull-out couch, cooking utensils, food and a cooler. Some of Georgia’s glamping sites provide beds, Wi-Fi, kitchens, air conditioning and heating. North Georgia Canopy Tours has seven teepee campsites in Lula. Amenities include heating, air conditioning and electricity. Community showers are located outside, and Georgia DNR says Wi-Fi is available. 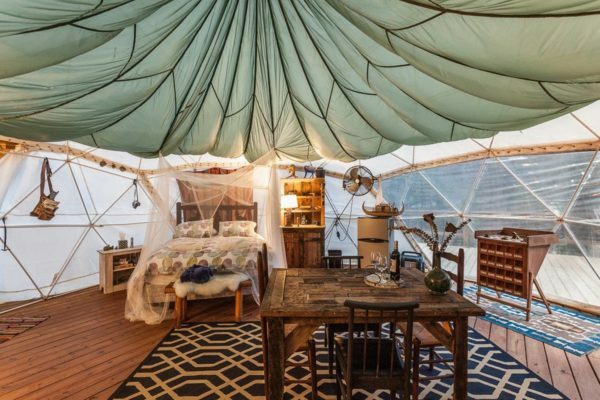 Go glamping in the sky and fulfill your childhood dreams. For a start, there’s tree houses for glamping in Atlanta, Blue Ridge and Banning. Wi-Fi is available in the tree houses of Blue Ridge and Atlanta. Amenities also include refrigerators, furniture and restrooms. Some of the tree houses have air conditioning. Stone Mountain has yurts with indoor restrooms and Wi-Fi. Their decks provide a spectacular view of nature. You can rent nature lodges and cabins in Helen, Chattahoochee Bend State Park and Amicalola Falls.